The Pioneer Mural in Arthur is painted on the south wall of the Hunter Tax Management Office at the southern entrance to the village. 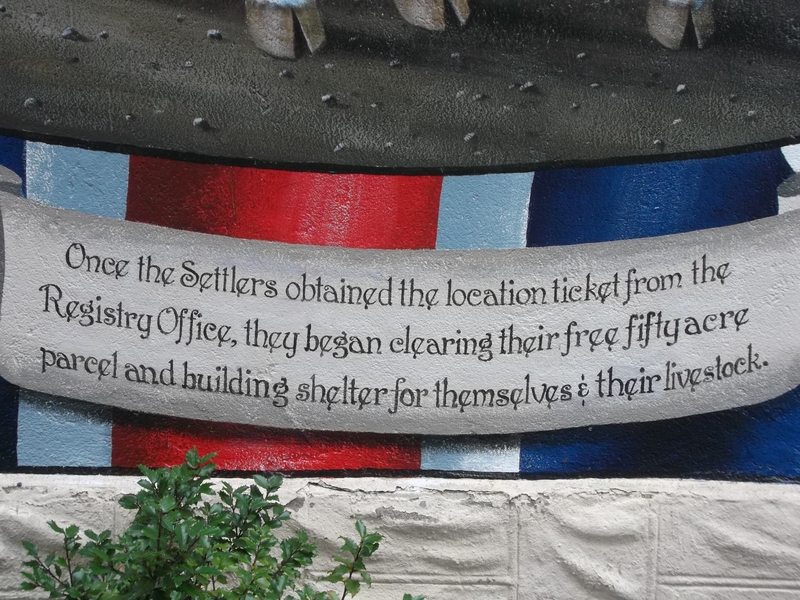 The location of this mural is symbolic as this office building is the former County Registry Office and the mural depicts the arrival of early European settlers in the area. The mural itself depicts an early settler departing from the Registry Office with family and his yoke of oxen. The settler has in his hands his ‘location papers’ which entitles him to a free 50 acre plot of land in Arthur Township. To reach his property he would have travelled north on the Garafraxa Road, what is now highway 6. 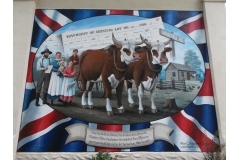 This was the first of several murals commissioned by the Arthur Mural Committee and was designed and painted by the late artist Allen C.Hilgendorf in 2010.